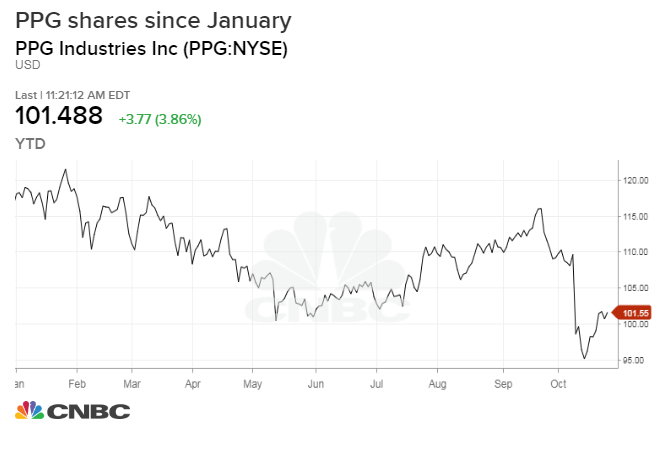 TORONTO — Trian Partners co-founder and chief investment officer Ed Garden said Thursday that PPG Industries needs to replace its “struggling” management to reverse disappointing profit at the global coatings company. Garden told investors at a conference that current PPG CEO Michael McGarry should be replaced by former chief Chuck Bunch, who “knows how to run this business.” Garden also said PPG should consider splitting into two focused companies: a global architectural coating company and an original equipment and industrials company. Trian, the activist hedge fund Garden founded with billionaire Nelson Peltz, is known for taking stakes in companies and pushing them for change. It recently won a high profile battle to get a seat on the board of Procter & Gamble. Shares of Pittsburgh-based PPG are up 3.9 percent on Thursday. Trian disclosed a $690 million position in PPG Industries earlier this month, representing a 2.9 percent stake in the 135-year-old manufacturer. The fund released a white paper detailing its vision for PPG on Thursday. PPG is one of largest coatings manufacturers in the world, with a market capitalization of about $26 billion. Thanks to PPG’s scope and scale, the company is seen as a corporate barometer for the health and direction of the global economy. On October 8, PPG issued a profit warning, informing investors that the company expects to miss consensus estimates by 10 percent in the third quarter and by 20 percent in the fourth quarter, Garden said. This marks the third consecutive third-quarter profit warning for PPG, the Trian CIO said. The company also lost its business with home improvement retailer Lowe’s in February, a major loss for its paint business. Garden also said that while management is struggling to keep a lid on material and foreign exchange costs, the board has some options left. Trian is urging the company to consider separating into an architectural coatings company and an industrial coatings company, allowing the company to create value through two “pure play” businesses. The split could also help its architectural business focus on growth and strategic planning as it loses market and and misses opportunities, according to the Trian thesis. Garden, who is currently a director of General Electric, has previously served on the boards of Pentair, Wendy’s and Family Dollar Stores. Garden and Peltz founded Trian in 2005.